It is fair to say that many long-term residents of Norfolk would have trouble placing the parish of Illington on a map. The area is a sparsely populated area dominated by the forests of Thetford Chase and the Army's Stanford Battle Area. The parish is north-east of Thetford, north of the A11 Norwich to London road and just east of the Peddar's Way Long-distance Path. Today there are only a few scattered farms and the populations in the past indicate this has always been the case. 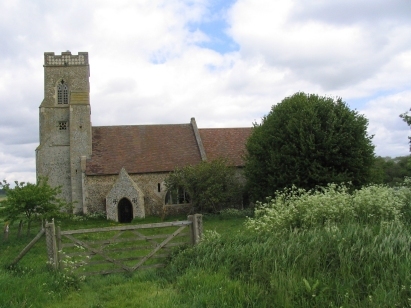 St Andrew's church is a difficult one to access, hidden behind some barns and along an overgrown field-edge path. The church, now redundant, sits forlorn in a paddock-like graveyard full of undergrowth. 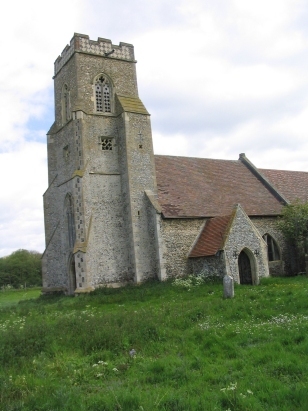 The church is Norman from the 11th to 12th century. The register covering the period of this transcript was finally deposited in 2010 and the as a consequence the original transcript which had been prepared from the rather difficult Bishops Transcripts has now been revised, corrected and completed from the original register held on deposit at the Norfolk Record Office. The register is in good condition and in time will be filmed and become accessible both at the NRO and also the Forum in Norwich.